Following the path around Barangaroo Reserve, in the inner city suburb of Barangaroo. 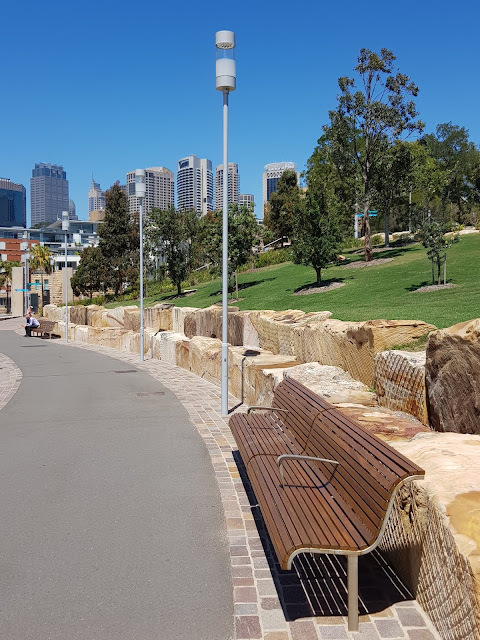 This was once the site of a concrete industrial container terminal which has been transformed into a foreshore park, with sandstone blocks used to build a naturalistic headland and terraces, landscaped with native trees and shrubs. The sandstone used at Barangaroo Reserve was extracted from beneath, in what is now The Cutaway, the reserve's large cultural space. The Sydney skyline can be seen in the distance. Linked to: Wordless Wednesday, Wonderful Wednesday, Wednesday Around The World, Photo Souvenir. How wonderful to have such a wonderful walking path! Have a great week ! It's the light posts here that catch my attention- different from the ones here. It's looking nice, I've yet to visit it, maybe next time. I would like to visit based on the name alone! And besides, from your photos Barangaroo looks like a beautiful place to be. Looks amazing Jim, we had a quick look when we were over in April. Looks better now is my guess. It's an amazing transformation, Stefan. The blocks of stones themselves are fascinating. Looks like a very pleasant spot. I love the way they have used the rocks Jim. Have a great weekend. What a pretty place, i love the stone as a kind of "fence."